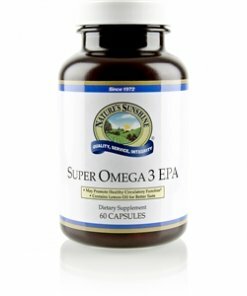 Nature’s Sunshine Super Omega-3 EPA supports cardiovascular health as well as the general health of the entire body. While most fats can prove harmful to the body, omega-3 fats, particularly the two in this formula–EPA and DHA, may reduce the risk of coronary heart disease. Omega-3 fatty acids play an essential role in cell membranes, nourish the structural system, and help keep the skin in good health. 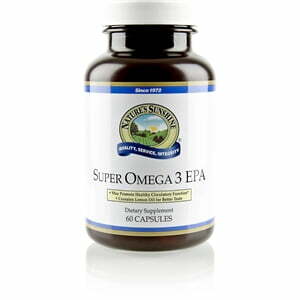 Super Omega-3 EPA consist of 380 mg EPA and 190 mg of DHA. The formula blends lemon oil with the omega-3s to reduce the fishy aftertaste and to decrease gas.